Salvation And Survival: The Conflict Of A Cosmic War: Does Palmyra Serve A Dual Purpose? The Conflict Of A Cosmic War: Does Palmyra Serve A Dual Purpose? One cannot ignore the diabolic nature of headlines such as this: Slaughter in the Roman amphitheatre: Horrific moment ISIS child executioners brutally shoot dead 25 Syrian regime soldiers in front of bloodthirsty crowds at ancient Palmyra ruin. The news is gruesome. As both Breitbart.com and the U.K.'s Daily Mail report, ISIS has released a significant new execution video from the historic city of Palmyra, in the Syrian desert. Child executioners are shown in the video being forced to brutally slaughter a group of more than 25 Syrian soldiers. The massacre takes place in the historic amphitheater at Palmyra, an ancient Roman city cited as a UNESCO World Heritage Site that has recently been overrun by ISIS terrorists. The articles go on to record that the executioners appear to be in their teens, leading some to believe that these children are graduates of the Islamic State's terrorist training camps. But the cold-blooded manner in which they simultaneously pull the trigger on their victims, while "performing" on the stage of the historic amphitheater in front of a crowd of eager audience members, tells a larger story... one of demonic influences and false gods. The history of Palmyra actually is even older than the Roman Empire. It is mentioned in ancient historic texts as early as 2000 BC, and is mentioned, or referred to, in the religious books of three of the world's prominent religions ... The Christian Bible (Second Book of Chronicles 8:4) records "Tadmor" as a desert city built (or fortified) by King Solomon of Israel, and it is mentioned in the Talmud, as well. The ancient historian, Flavius Josephus calls the city by the Greek name "Palmyra", attributing the founding of "Tadmor" to Solomon in Book VIII of his Antiquities of the Jews. Later Islamic traditions attribute the city's founding to Solomon's Jinn (in Arabian and Muslim mythology, a jinn is an intelligent spirit of lower rank than the angels, able to appear in human and animal forms and to possess humans). I recite all this ancient history to let you know that I think it is no accident that the city of Palmyra is the latest focus of interest by ISIS for a reason... perhaps for two reasons, as I will venture to explain. First of all, I have made it clear numerous times that I am not a Bible scholar; just a person who is seeking to understand how big our God is, and to comprehend all the sovereign ways He works in this world He created. That being said, Breitbart.com is clear in pointing out that the Islamic State captured the ancient city of Palmyra in May, an area replete with priceless ruins and artifacts now in the line of fire. ISIS jihadists have become notorious for destroying such pre-Islamic artifacts, claiming that their existence constitutes “idolatry” to false ancient gods, and thus they must be destroyed before the eyes of Allah. While the group initially released a video promising that they would not destroy ruins in Palmyra that did not violate this “idolatry” provision, recent photos indicate that many of the ruins have been removed from the area, and the city itself has been filled with land mines. The amphitheater appears intact, perhaps due to its usefulness as an arena in which to dramatically stage executions. The Western world, and the major news outlets, have all expressed their dismay that ancient ruins and artifacts are being destroyed throughout Iraq and Syria by ISIS, and there are international concerns for the fate of these spectacular ancient treasures. But let me ask you to consider this: what if these ancient ruins and "spectacular treasures" are really ancient temples to false gods and symbols and idols of false worship? What if God, in His infinite wisdom and sovereignty, is using ISIS to cleanse the Middle East of some of its oldest demonic temples and strongholds of demonic influence? Think the modern God of Grace and Prosperity would never allow evil people to be used to further His purpose? Think again ... and think of Judas Iscariot, and Nebuchadnezzar, and Antiochus Epiphanes, and, yes, even Hitler. I'm not saying for certain that this is what is going on, but I would never discount God's intent in this cosmic conflict with Satan. What is ironic, is the possibility that while ISIS thinks they are destroying icons to false gods which offend Allah -- they could actually be destroying false idols that offend YHWH! And speaking of The Adversary, what is his play in this cosmic battle for control of the world? For starters, we need to realize that the amphitheater where these latest ISIS executions took place is not the only ancient historical architecture associated with Palmyra. This city is also the home of the Temple of Bel, a false Babylonian god mentioned in the Bible. In Jeremiah 51, God says He "will punish Bel, the god of Babylon, and make him vomit up all he has eaten." And Isaiah 46:1 refers to two Babylonian gods, saying, "Bel bows down; Nebo stoops; their idols are on beasts and livestock." Bel was the Moon-god of Babylon, and a temple dedicated to him still exists in Palmyra. The prophet Isaiah stated the image of the god, Bel, was stamped on the beasts and cattle by the Babylonians. And you will be interested to know that the symbol of Bel, the Moon-god, is a crescent moon with a star. The symbol of Islam! 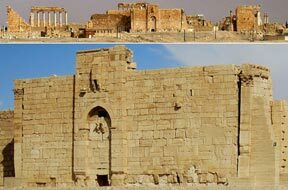 So, right here in Palmyra, is the Temple of Bel, which stands out from the other religious buildings of Palmyra for its size and location; its main altar (space reserved to the god) was consecrated in 32 AD. The immense size and the dominant location of the temple are an evident sign of the prominence of Bel/Baal over the other deities worshipped at Palmyra. And ISIS and Islam have a direct connection through their iconography. Now, so far as I understand, ISIS has promised to spare much of the ancient site of Palmyra and only destroy statues deemed polytheistic. What is interesting to me is that both the Roman amphitheater and the Temple of Bel appear to still be intact. Could it be that Satan's countermove in this cosmic war is that the amphitheater stage is being used to display blood sacrifices to the ancient god Bel (or Baal), which establishes and feeds the demonic stronghold that is at the heart of ISIS? Activists and a monitoring group said ISIS used the majestic Roman theatre in Palmyra to execute nearly two dozen pro-Syrian foreign fighters, along with more than 200 people since their offensive in the area began in mid-May. These latest executions show that they do not plan on stopping. I realize that my proposals are pure conjecture. I do not claim to know the mind of God or His specific plans to combat Evil. And I certainly don't try to entertain thoughts of the Devil's schemes. But my spirit is telling me that this location in Palmyra has great significance to both sides of this eternal and supernatural battle. All I know is that what I am seeing in this day and age is not too far removed from what occurred in the Bible. God has used people -- both good and bad -- to further His plans toward the ultimate finale. And Satan has tried to not only counterfeit each move, but continued his efforts to open pathways to his influence and build demonic strongholds. Is it possible that ISIS is being used by both sides in this cosmic war? That they are an instrument of God's judgment against ancient pagan temples of idol worship, AND a tool of Satan to secure not only his demonic foothold in the world, but to persecute God's own people? It has been a battle since the beginning, and I sense that we are approaching the last campaign. I'm glad I know who wins! Proverbs 16:4 "The Lord has made everything for its purpose, even the wicked for the day of trouble."